Pokemon Let’s Go has changed Pokemon in many ways. It makes it so the player can’t fight wild Pokemon, and that might sound like a bad thing, but it makes the game quicker more efficient and easier. It also changes the process of catching Pokemon and shiny hunting. Now that the player can see Pokemon while walking through the routes, it is possible to actually catch ’em all. 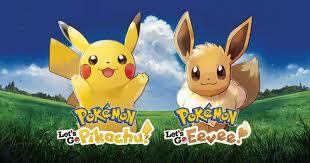 Some pokemon are version-exclusive (for either Pokemon Let’s Go: Pikachu or Pokemon Let’s Go: Eevee) so here is a guide. Growlithe (P), Arcanine (P), Vulpix (E), Ninetails (E), Oddish (P), Gloom (P), Vileplume (P), Bellsprout (E), Weepinbell (E), Victreebel (E), Sandshrew (P), Sandslash (P), Meowth (E), Persian (E), Electabuzz (P), Magmar (E), Grimer (P), Muk (P), Koffing (E), Weezing (E), Mankey (P), Primeape (P), Ekans (E), Arbok (E), Scyther (P), Pinsir (E). Shiny hunting has changed too; now there are catch combos. Catch combos are the amount of Pokemon of one species caught in a row, like 50 Caterpies. The combo can be broken in several ways, turning off your device, catching other pokemon, or having a pokemon escape. If you get 31 of one pokemon in a row your shiny odds increase exponentially. The easiest place to do this is viridian forest do to the high spawn rate of Pokemon there. One of the few problems with catching ’em all is the two new Pokemon Meltan and Melmetal their evolution. They can only be caught by being transferred from Pokemon GO and it takes a lot to get Melmetal: 400 Meltan candies!